There will be a annular solar eclipse on February 26, 2017 visible across Chile and Argentina in South America, as well as Angola, Zambia and the Democratic Republic of the Congo in Africa. 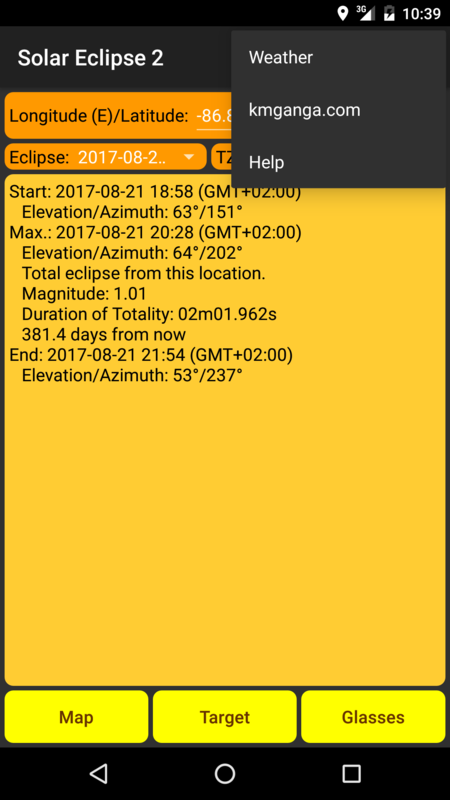 This app will help you determine if you will be able to see it or another upcoming solar eclipse. 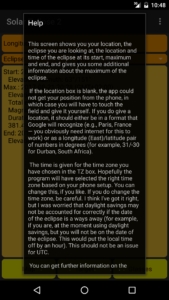 It tells you when upcoming eclipses will occur, and how visible it will be from your location. It will also show you how visible it is from other locations, and help you find where it will be on the sky from where you are standing. 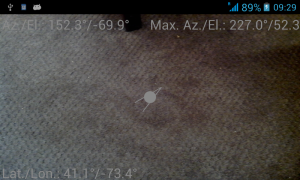 Figure 1: The main screen when your location is detected and you can see the given eclipse from your location. Note that in this case we’re looking at the August, 2017 eclipse from Nashville, TN. When you first start the program, you should have something that looks like the first figure. If things have gone well, you should see a pair of numbers with your location (i.e., your longitude and latitude) on the Earth (if you don’t see this, see below). The second line will show the date of the eclipse we’re thinking about seeing and the time zone (TZ) we’re using. 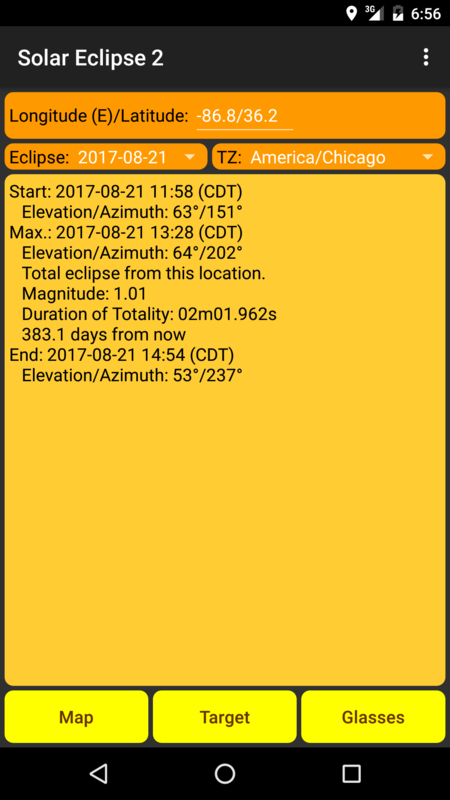 In the second, large, rectangular part of the screen you’ll have information about the eclipse, tailored to your location. It may simply tell you that you cannot see the eclipse at all from this location. However, if you can see it, you should see the date and time of the start of the eclipse, along with the azimuth and elevation (i.e., the location on the sky) at which this will occur — more about this later. There will also be information about the maximum of the eclipse. In addition to the date, time and location of the maximum of the eclipse, you’ll also have the so-called magnitude of the eclipse from your location, and the number of days until the event. You’ll have similar information for the end of the eclipse. 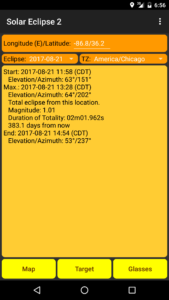 Finally, at the bottom of the screen, there will be a links to a map with more information, a link to a compass-like app which tries to help you find in what direction the eclipse will appear, and a link to solar eclipse viewing glasses on Amazon — NEVER LOOK DIRECTLY AT THE SUN WITHOUT EYE PROTECTION. Figure 2: Entering a city by hand. In many cases the app will be able to search for and find your location. If all goes well, the app should be able to detect your location and time zone automatically. If it doesn’t, or if you want to see what the eclipse will look like from another location, you can change these by hand. 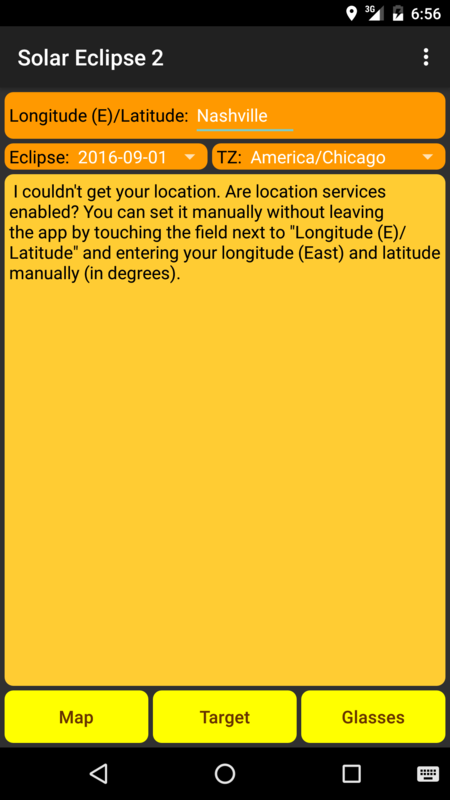 In many cases, for example, you can just put the name of the city your in at the Longitude (E)/Latitude prompt as shown in the second figure, and the app might be able to get the longitude and latitude of the city automatically. When it does, it will replace the location with the longitude (East) and latitude of the location. If even this doesn’t work, you can try to put your longitude and latitude in by hand (note that the longitude should be East of Greenwich. That is, most places in the US will have negative longitudes). This would like like the first figure. The two numbers should be separated by either a space or a regular slash (‘/’). Make sure to check the time zone in which time dates and times come. You don’t want to miss the eclipse because the times given were for the wrong time zone! Figure 3: Shows the Android menu choices. At this point, at the bottom of the screen, you can choose from ‘Map’, ‘Target’, or ‘Glasses’. 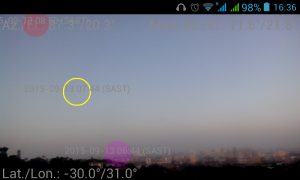 From the standard Android menu, you can also choose ‘Weather’, ‘kmganga.com’, or ‘Help’, as shown in the third figure. The ‘Weather’ choice simply takes you to a weather site for your chosen location. The ‘kmganga.com’ takes you to my site for the app, which is what you’re looking at now. Figure 4: The primary help. If you choose ‘Help’, you’ll get something like the fourth figure. You can return to the primary page by hitting the phone’s ‘Back’ button. There is also help in most of the other screens described below as well. Since it’s easier to update my website than the app, the website might have more up-to-date information. Figure 5: A map zoom over a location which will see the August, 2017 eclipse. 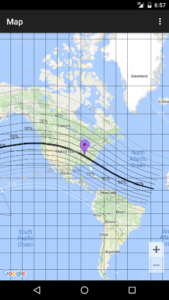 If you choose ‘Map’, you will be taken to a Google map showing your location (as a purple marker) and lines marking places where the Sun will be completely eclipsed, 90% eclipsed, 80% eclipsed, etc. 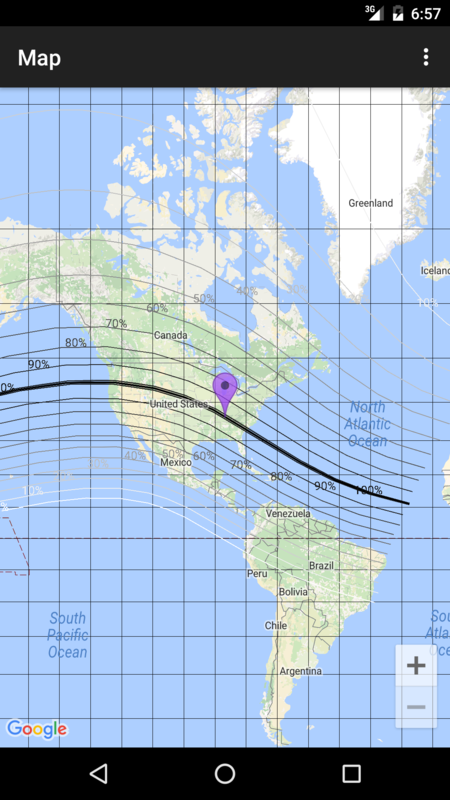 So, if your location is in the shaded region, the eclipse will be total or annular at some point from where you are observing. If you’re outside of the shaded region, the Sun will be obscured by some maximum percentage. These fractions are indicated by the line, and the amount the Sun is obscured is somewhere on each of the lines. Do you know where a certain azimuth and elevation actually is? I usually don’t. But if you choose ‘Camera’, you will be taken to a preview from your camera. This is basically a glorified compass, which will lead you to point towards where the eclipse will be. It’s a bit hard to describe, and I tried making a video of it, but it was a complete disaster — you’ll probably just have to play around with it a bit to get the idea. Figure 6: The camera preview part of the app. The arrow in the center of the screen indicates in what direction you must point the camera to locate the eclipse. But the basics are this: When you first fire up ‘Camera’, you should see what your phone’s camera is seeing, along with your location, the direction your camera is pointing (Az./El.) and the direction where the eclipse you’re interested in will be. In addition, in the center of the screen is a ball and arrow intended to guide to the location of the Solar eclipse. In Figure 6, the arrow is telling us that we should turn the camera up and towards the right. Figure 7: The ‘camera’ part of the app locating where the eclipse of August of 2017 will be seen. You should move the camera direction indicated to follow the arrow until you get to the eclipse. This might require a bit of gymnastics 🙂 When the camera is actually facing the eclipse, the grey ball and arrow disappear and are replaced by three circles, as in Figure 7. The yellow circle indicates the direction of the Sun when the eclipse will be at its maximum, which the two other shaded circles indicate the Sun’s location at the beginning and end of the eclipse. 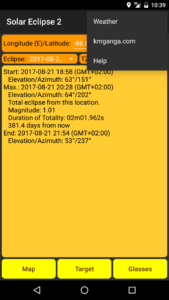 The times for the beginning, maximum and end of the eclipse are also given (for the time zone chosen in the first screen). 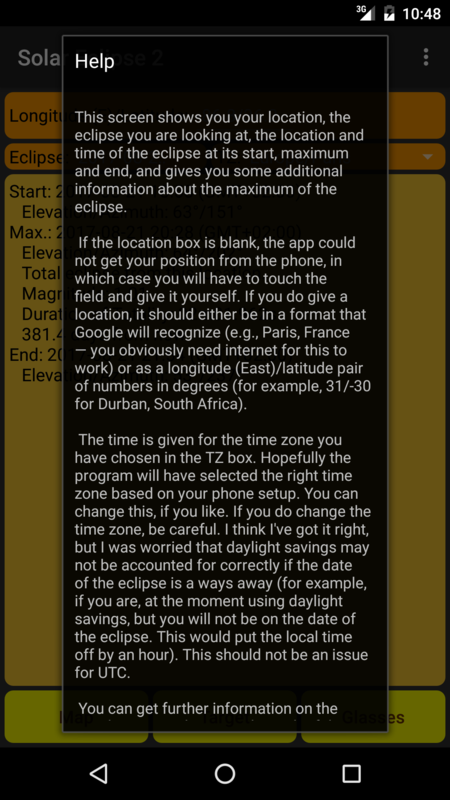 Figure 8: Predictions from the app for an eclipse seen near Durban, South Africa. 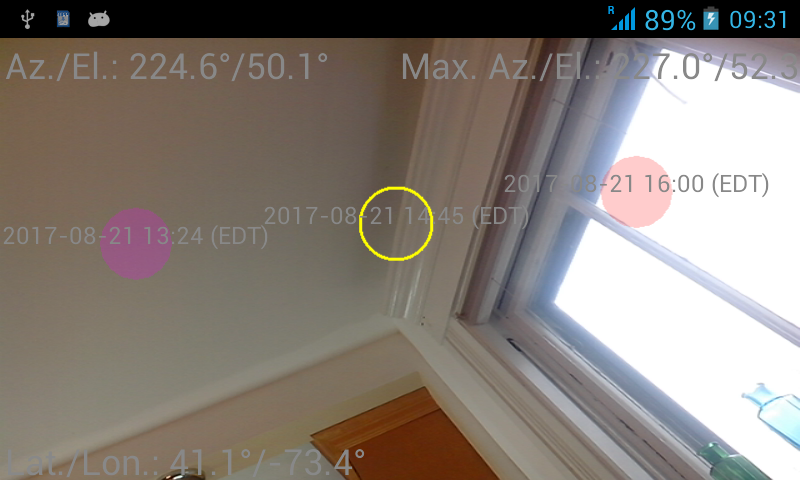 In figure 7 I was trying to see if I would be able to watch the 2017 eclipse through my kitchen window. It looks like part of it will be visible, but that I’ll probably have to actually stick my head out the window to see the whole thing. Not the most comfortable viewing. 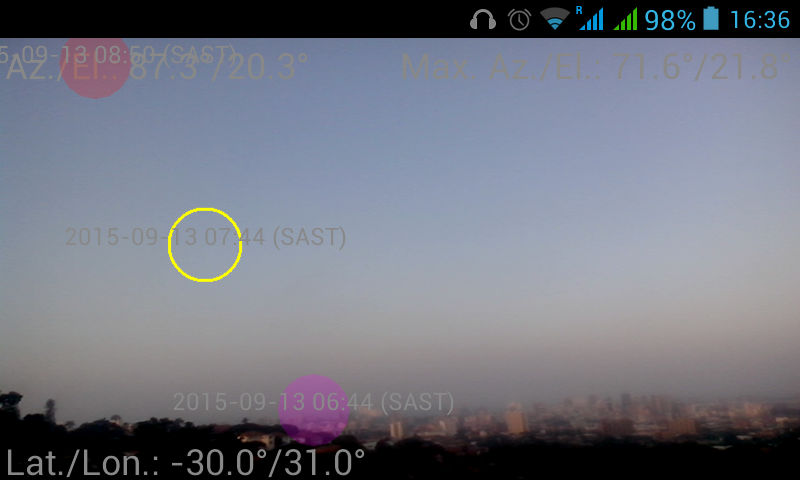 In figure 8 I show a more successful site search, for the 2015 eclipse visible from a hill overlooking Durban, South Africa. Figure 9: The preview with my hand over the camera and pointed straight up. Note that I’ve been having problems with my camera interface, so I often don’t actually see the camera preview — I only see the text, the arrow, and the eclipse circles. That is, this still functions as a compass, but isn’t as pretty. I’ll update as soon as I figure out what’s going on. You should be careful with these directions. Does it make sense that the Sun might be at the indicated location at the indicated time? For example, if it says that the Sun will be straight down at noon, there is something obviously wrong. To try to help diagnosing possible problems, there are six special directions that are marked with letters in the program. These are ‘Down’, ‘Up’, ‘North’, ‘South’, ‘East’, and ‘West’, denoted ‘D’, ‘U’, ‘N’, ‘S’, ‘E’, and ‘W’. When the camera is facing in these directions, you should see this letter appear. Figure 9 shows an example with my camera facing up (and so we see a ‘U’). Sometimes it a bit hard to see the writing on the preview, so here’s a hint: You can momentarily cover the camera with your hand (or anything else) to make the writing more visible. This is shown in Figure 9 as well. If the direction reading are ridiculous, this might simply be because you are in a big city, and the magnetometer can’t really work in that area. But I’ve also heard that the camera sensors can sometimes need recalibration. I’ve also heard that if you hold the phone/tablet flat in your hand and move it in a figure-eight motion for a few seconds, that this will trigger a recalibration. I have no idea if it’s true, but it might be worth a try, if nothing else works! This is a wholly amateur effort. For example: Why is it called Solar Eclipse 2? Well, there was a Solar Eclipse, but I lost the files necessary to update it on Google Play! This version includes bug fixes/improvements suggest by Brian, Michael, and Giuseppe (though these were a long time ago, so they may not even remember themselves!). I’m hoping to keep this program up-to-date, so please do (politely 🙂 report problems and suggest improvements. I can’t seem to systematically find the field-of-view of all cameras. If this is the case, I just assume that your field of view is the same as for my camera. This will, of course, cause (hopefully small) errors in the location of the eclipse events. Again, let this be a warning that you shouldn’t use this app for precision work (in this case the exact location of where the solar eclipse shows up on your camera preview)! Solar Eclipse 2 uses the camera only in preview mode. The images (or videos) are not stored at all. 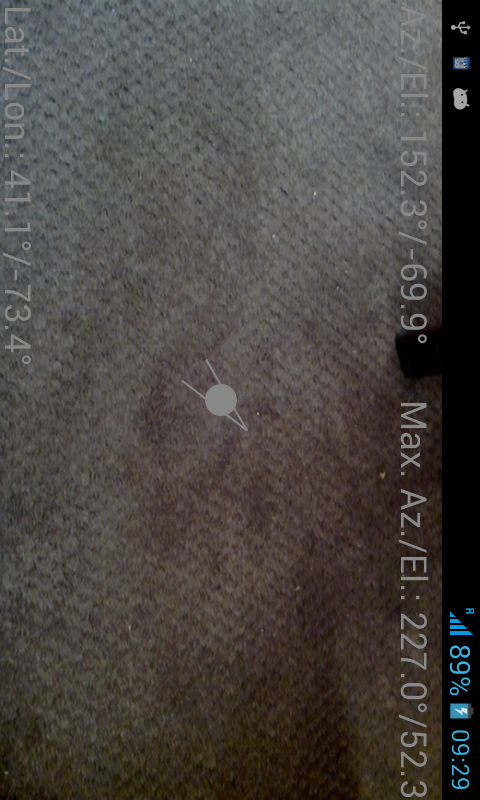 The app could actually work without the camera (with just a grey background on the screen), but I kind of like it with the camera preview, so that you can get an idea of what will be in the foreground when you observe the eclipse. 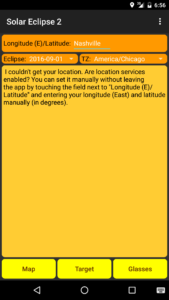 Google doesn’t make a point of it, but the app also uses your location information. This is necessary in order to calculate when and where you will see (or not) the eclipse. But again, this information is not sent to anyone except Google maps, for making the map with your location and the eclipse location. There are a couple of ways to connect to the internet from the app — to this page, for example, or to Amazon, in order to get Solar Eclipse glasses. I don’t store any information from this. Amazon may, but I don’t have much control over them 🙂 I’ve also added a Google ad, which would be similar. Like all Android developers, Android provides me with some anonymized statistics about the downloads of the app — what country, language, Android version, etc. I find this interesting, but don’t actually use it for anything. Since the app has been installed thousands of times, it’s pretty hard to get any individual information from these statistics. The Bessellian elements used come from the NASA Goddard Space Flight Center Solar Eclipse website by Fred Espenak.